After a late start I arrived at None Go Bye Farm to an afternoon of warm sunshine. There are 3 lakes and from quickly scanning the 2 lakes at the top of the complex it looked quite popular. I decided to fish the third pond which was furthest away (in the hope it would be quieter). It was still surprisingly busy, and, after a quick walk around I thought it was going to be a difficult afternoon as every peg with cover was taken. That left 5 open water pegs available. I was considering a walk to the other lakes when a man in the corner peg told me he was leaving shortly and offered me his peg, after quickly glancing around I decided that it looked like a good peg to fish and I was told “meat and mussels” did the business. Unfortunately I didn’t have mussels but I did have meat. An angler to my left told me it was a very quiet day and that only silver fish were coming out. I hedged my bets and baited 2 swims, one straight out in front of me and one to the right. As it was a corner peg there was a gap in the lily pads which looked fishy. After setting up I shipped out straight in front, double red on the hook. The float bounced around on the surface as the swim bubbled away nicely. The angler to my right walked over at this point to see how I was doing. He advised to fish about 18 inches under the surface and frequently feed maggots, so I adjusted me third rig accordingly, but, for the time being I stuck to using bait on the deck. 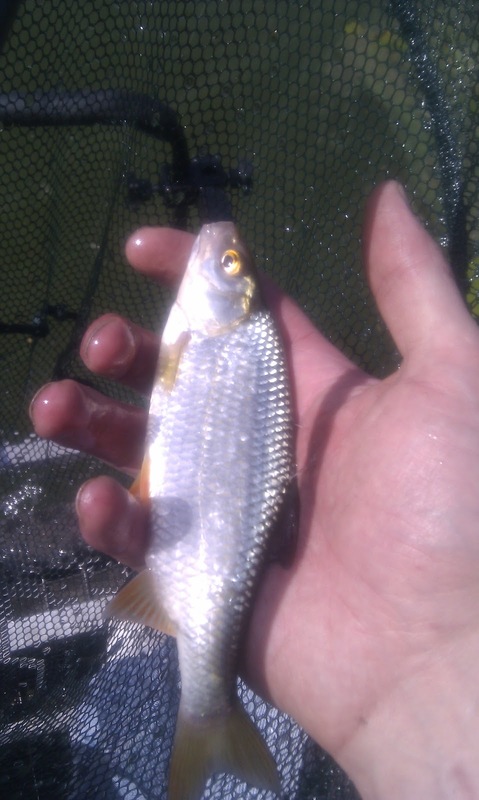 The float slipped under, I struck into the fish, no real size, a roach of about 5oz. I switched to worm, again roach, meat, roach, double red, there was nothing I could do to get through the little buggers. I decided to switch swims every half an hour. After 50 or so roach up to roughly 6oz I choose to go to the corner swim. From the initial 30 minutes fishing in the corner using meat, I noticed that some big carp were moving in the lilies to the right. I started throwing pieces of bread in to an immediate response. Long slurps were slowly moving from the inner lilies to the outer edges as the fish were feeding more confidently. I quickly put together a long hooklink of about 18 inches of 7lb N-Gauge line with a size 12 Animal Kamasan hook. I lowered the bread on to the water and waited… After a few minutes the lilies started to quiver a mouth appeared behind the crust i had on the hook. Gone! 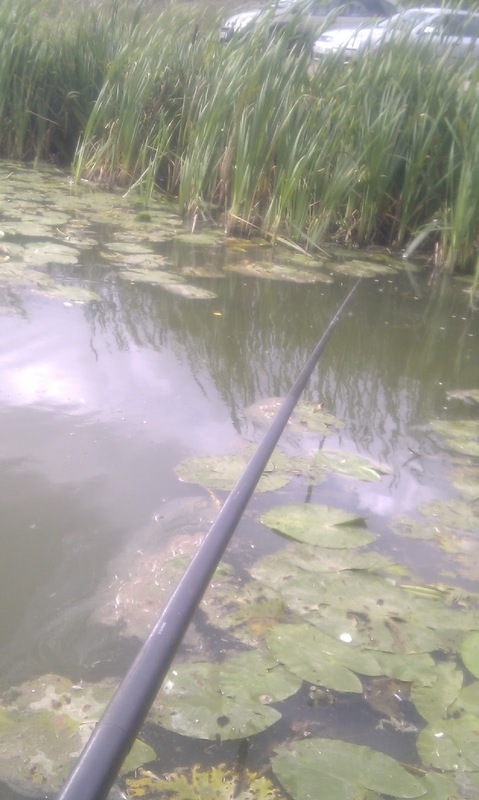 I struck, The elastic streaked out of the tip of the pole, I thought i’d lost the fish as it had buried its head in the lilies but after 20 seconds of some fairly serious side strain the fish swam back out into open water. I couldn’t believe my luck! It was a tough fight but after 5 or so minutes I brought the fish to the net. It was an easy 8lb (maybe bigger), but after this there was very little activity on the surface. I switched to a bottom rig with meat as bait. It was amazing how quickly I got a bite. The groundbait mix of Crazy Bait Black and Magic with pellets seemed to have the fish interested. The floated bobbed around uncertainly and then, it tore away under the surface. 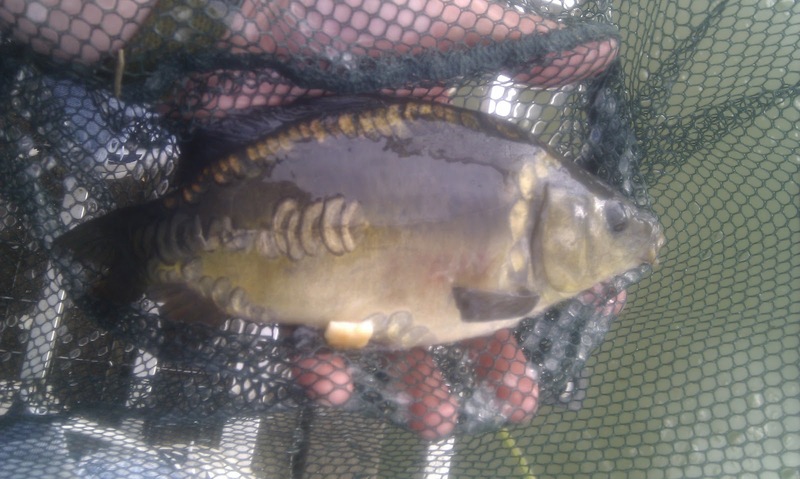 This time it was as smaller F1 carp of about 1½lb. Again I shipped out and within minutes the float bolted under the surface, this time it was a small tench, then another carp, then what looked like my first golden tench! 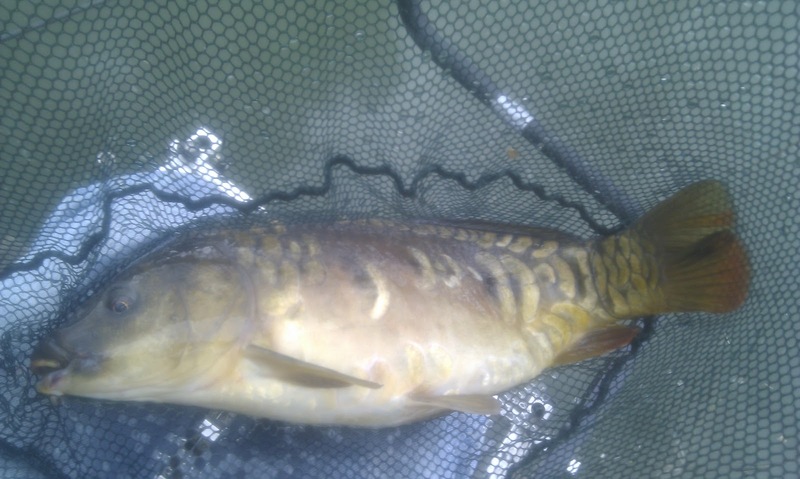 This was followed by another 10 or so F1 carp. They were coming thick and fast now and the bigger carp were starting to show interest once again in the bread on the surface. I switched again to the surface line. After a nervy 10 minute wait my piece of bread was gobbled up. This was it, the big one! The elastic rocketed out of the tip section after 2 minutes of the desperately fighting the fish, it became firmly lodged in the lilies. This wasn’t coming out. After a further 2 minutes of gently trying to persuade the fish to move, the hook pulled free. The one that got away! 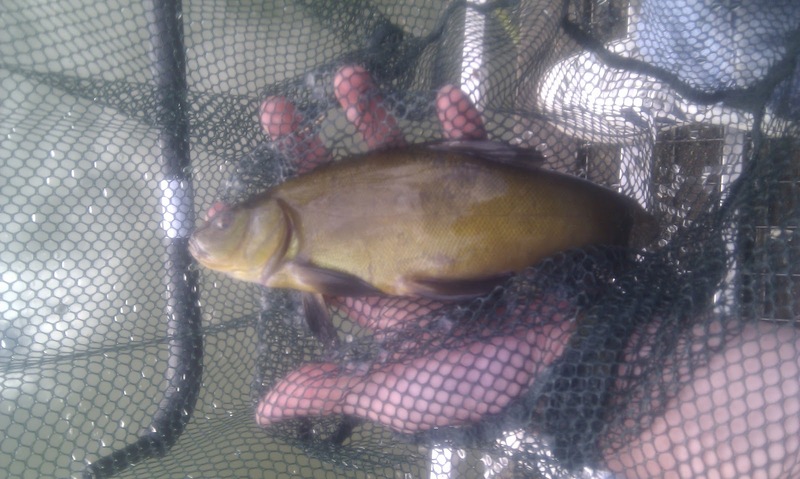 After that I went back to the bottom successfully landing another 3 F1 carp and 2 tench. 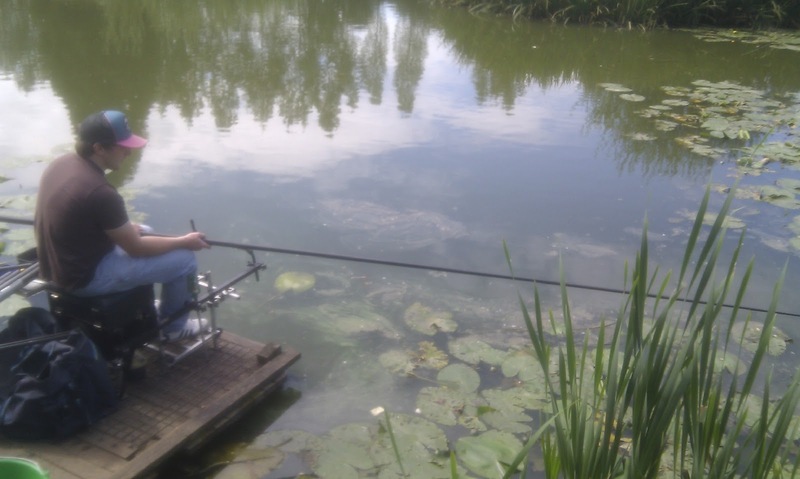 It was a very enjoyable afternoon with a range of fish being caught. The lakes were well pegged (albeit a bit busy) there was a good general layout with plenty of fish in all 3 lakes. I would certainly recommend the water to all skills of anglers, as I’m sure from the afternoon session I easily had 50lb+ of fish. I also had a little farm area you could walk around if you need or wanted a wander. I will certainly be going back the soon, the hardest thing will be deciding which lake to fish! It would have been nice to use a keepnet. Incredibly rude owners, they hold their hands out expecting money whilst on their mobiles..all of them, the blond haired son, the daughter & the farmer/owner..will never return there. Next story Trip #8 – Toms Pond, good weather for ducks! Previous story Trip #6 – Canal wanderings for Wily Perch!